Flat roofs are relatively inexpensive and very efficient to keep your buildings and your internal assets covered and protected from the weather. What can you do to identify flat roof defects? Whilst their relatively low cost for a good protection plays to their advantage, this type of roof is also notorious for defects that often remain unnoticed until it is too late. As with any part of a building, they will be subject to wear and tear and will receive copious amounts of water. Regular inspection of the roof is essential to make sure that this essential element is in tip top condition and kept free of defects. One of the most common defects is water ingress which then leads to a leak inside the building. When water ingress does occur on a flat roof, damage often goes unnoticed for considerable time as water slowly penetrates and soaks the decking, insulation and/or structure beneath. This can lead to extensive damage. If left unattended and no leak detection surveying takes place, it can weaken the whole structure and have catastrophic operational and financial consequences for you. Core sampling allows the surveyor to see the make up of the roof and locate where water saturation may be. The image above shows what appears to be a roof in a good condition with no obvious signs of moisture ingress, however; the tenant has been complaining that there are leaks into his top floor office. Imagine, this is your tenant. 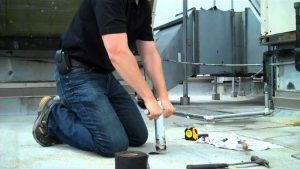 You arrive on site with a surveyor and the tools for the job, get onto the roof above the leaking office, but where should you start to take a core sample? You carry core samples, one is wet, two are dry. So we know that the insulation is saturated, but to what extent? Using the roof image above, grab the slider and drag it across the image to reveal the thermal image, in short, red colours reveal saturated insulation (You can find out more about the meaning of infrared colours in our Understanding Colours post.). This tells you everything you need to know about the accuracy of core samples. By relying solely on core sampling, your surveyor could mistakenly concludes that the entire roof needs replaced or on the opposite, that the roof is sound. How can you know for sure? If your surveyor is employed by a roofing company, the impartiality of the advice could well be put into question. It is a matter of trust and reputation. take one core sample mid-way. Critically this should be at random locations on the roof, not in a straight line. That way the surveyor can find out if water is coming in at parapets and tracking it down, if the area around the outlet is wet as water loves gravity and then try to ascertain the extent of the damage at the mid-point. The surveyor will take appropriate notes and photographs. Then of course, they must patch the core sampling holes by resiting the sample and sealing the edges. Often this is made using blow torches. Again for you invalidating roof construction guarantees by cutting holes through potentially perfect waterproofing. For the surveyor, the risks are inherent to health and safety: slipping on a wet surface, working at height, stand alone working, fire protection, etc. It is therefore easy to conclude that core sampling should be a last resort surveying technique, just before the nuclear surveying method. If you are an asset manager, estate manager, building surveyor and are being asked to make a budget go as far as possible, then it is essential you get and give impartial advice to the building owner. By investing in an infrared thermographic (IRT) survey, you mitigate risk from a third party advising whichever solution meets their commercial needs and wants. Infrared can’t tell the difference between polyurethane and fibreboard. Wet is wet and that effects the temperature on the surface. Why? Simply put, wet insulation doesn’t insulate as well as dry insulation – so heat escapes the fabric. Also because water has a high emissivity. This means that water radiates its energy particularly well when it has finished absorbing it from the sun and from the building itself. This high emissivity makes the wet area appear warm to the infrared thermal camera. With drones now extensively used to take the thermal pictures, thus eliminating most if not all health and safety risks for the surveyor as well as improving the accuracy of the surveying results, there is little not to like about infrared. IRT may help you save hundreds of thousands of pounds by turning what you had assumed would be a complete “strip and re-new” into a partial strip and overlay. Conversely however the opposite may be true. The point being: you will get the truth and if you are interested in delivering value to your clients and managing a sustainable portfolio, that’s an invaluable weapon in your armoury. Core samples have their place of course. We will always advise you hand your infrared survey reports to your roofing company who may then core and confirm the infrared survey findings. More importantly the core sampling will allow them to establish what the roof is actually made of so that they can propose the appropriate solution for your roof refurbishment. Do you own or manage buildings with flat roofs? We would like to know what surveying method you favour and why. Drop us a line, give us a call, let's talk all things flat roof surveying. This entry was posted in Blog and tagged core sampling, defect detection, electronic leak detection, Flat roof survey, infrared survey, infrared thermal imaging, leak detection, roof defect detection. Bookmark the permalink.